Housed in a convent, this is one amazing museum - and building! Arranged around two quadrangles, long halls and smaller rooms house historic exhibitions of: art, sea-faring, farming hand tools, weaving, guitars, taxidermy of fauna and sea life on a grand scale (native birds, small animals, sharks, a turtle found at Garafia, etc,) and a beautiful library - to name but a few. 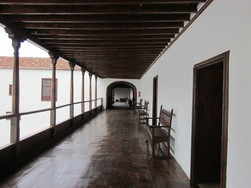 The Franciscan monks that accompanied Alonso Fernandez de Lugo in the conquest of La Palma, after spending 15 years living in straw huts, started building a monastry in 1508 at the express wish of Queen Juana, to be the Order's headquarters in the Canary Islands. The Castille coat of arms over the main door is a sign of their royal patronage. 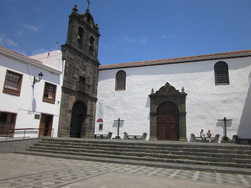 The church, built in the course of the XVI and XVII has one of the first examples of Renaissance art on the islands: the Montserrat chapel, built around 1540, with its unique stone arch and wood panelled roof. It also has some richly worked Barroque altar pieces and a splendid collection of Flemish, Sevilla, American and Canary Island images making it a real sculpture museum. 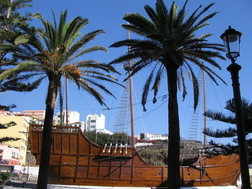 Housed in a full-scale replica of the Santa Maria ship as sailed by Christopher Columbus, not only are the exhibits interesting but also the fact that this apparently wooden sailing vessel is made of concrete! 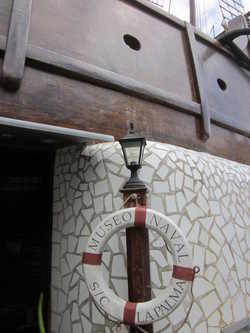 Inside you will find nautical charts, navigational instruments, models of ships, old photos, canons, etc. You can also have a good old clamber on deck and wonder what it was like to sail across the uncharted Atlantic in such a small vessel! Ah, those were the days. Los Llanos Opening times: Tue – Sat 10.00 hrs to 14.00 hrs and 17.00 hrs to 19.00 hrs. 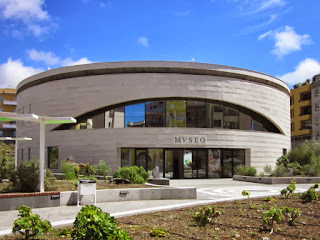 This is a new-build museum (2007) in which you can follow the history of the pre-historic Benahoarites - the aborigines of La Palma. In it you can find a recreation of their settlements, information about their rites and gods, about their craft skills of treating stone, ceramics, bones, animal skins and wood. Also on display are rock carvings, mummies, tools and a huge display of ceramic residues which have been collected from findings on the La Palma. Mazo, Casa Roja with fine embroidery displays. Casa Roja, built in 1911 is spread over two stories, the ground floor being given over to old photographs, drawings and documents regarding the Fiesta of Corpus Christi from its inception until today. The second floor displays traditional dress and exquisitely embroidered tablecloths, church vestments, home decorations etc. Opening times: 10.00 to 14.00hrs and 15.00 to 18.00 hrs Saturday: 11.00 to 18.00 hrs. Sunday: 10.00 to 14.00 hrs. 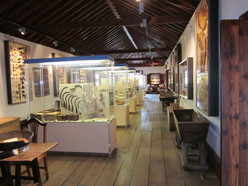 El Paso, silk museum where you can learn all about making silk garments starting with the silk worm. La Palma is the only place in Europe where this highly labour-intensive method used. Anything you ever wanted to know about silk - they can tell you here. Opening times: Mon to Fri 10.00 hrs to 13.00hrs also Tue and Thu 17.00 hrs to 19.00 hrs. Tazacorte banana museum where, over two floors of an old Canarian house you can discover the history of banana production, impact on society and the economy. Apparently this is the only 'museum' in Europe dedicated solely to bananas. It's very informative, a tiny entrance charge and you can enjoy a complimentary banana while you look around! Opening times: Summer - Mon to Fri 10.00 to 13.30 and 15.00 to 19.00 hrs. Winter - Mon to Fri 10.00 to 13.00 and 16.00 to 19.00 hrs. La Zarza, Garafia an archaelogical museum/site with pre-Hispanic rock engravings, caves and a museum. Incredibly the engravings were only discovered in 1941, having sat there unnoticed for approximately 500 years and even though many of them of are quite large. At La Zarza there are 29 separate engravings and just nearby at La Zarzita, there are 18. Nobody can say for sure what the spiral, circles, meandering or straight lines signify, but this site is - and was - obviously of great importance. 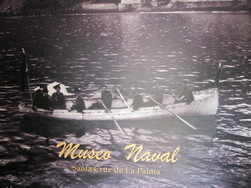 The entrance fee is 1.80 euros and it is open throughout the day.